A lead group of riders steer convoys through towns in the North and South Islands, picking up support riders in every region along the way. 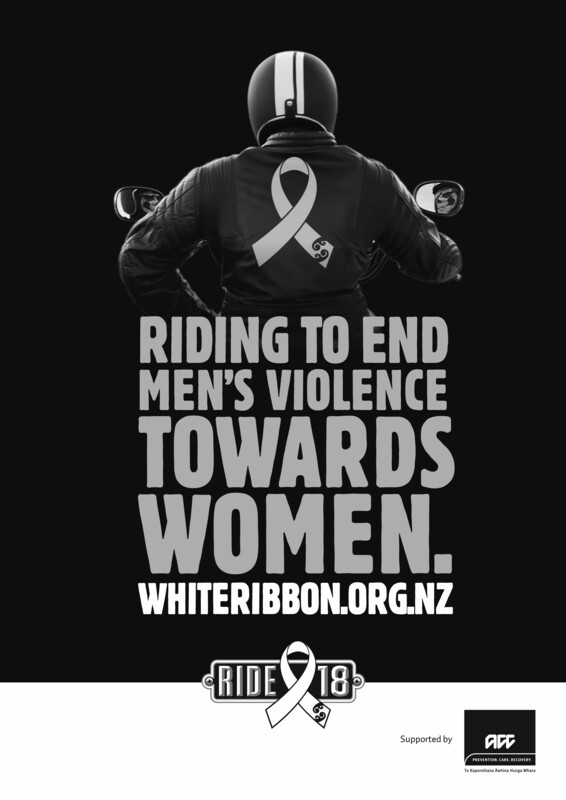 In many regions, local riders will lead the White Ribbon into their town and this year we are encouraging scooters and bikes under 250cc’s to join in when the event is within city and town limits. Please contact us if you would like to support the kaupapa by leading the riders in your local region. Events are organised in every town, ranging from school visits, marches and breakfasts, to fashion parades, quiz nights and Dads and Lads days. Every event is an opportunity to bring this issue into the open and get people talking. We will then see if we can accommodate your request. The form includes information on what you will do at the actual event. This information is not required until closer to November, but we know it helps communities plan their event. Joining the Ride is free and easy (though if you are taking part for more than a day trip, you may wish to eat and sleep with the Riders). For more details, head to the Riders page. To organise an event or have the riders visit your town click here. Events are listed on the schedule and vary from town to town. Lead riders are trained each year and this is even more important as we are focusing in sexual violence and the issue of consent. Accommodation consists of Marae, Army/Navy bases and budget accommodation. It is estimated that $25 per night will cover your costs. Contact us to book your accommodation. Please note accommodation can not be guaranteed, so you need to contact us if you wish to stay with the riders. Get updates on the Ride by joining our White Ribbon Ride mailing list.